Awesome . So glad somebody did one of these already. Reminds me of the old days, where something would be awesome and it'd be up on the Think Tank in seconds. THAT IS GLORIOUS!!! One of the best, weirdest things about the old Star Trek. These guys are really showing their fandom. That's true... in the old days, by the time I got around to this it would have been done by at least four other people ! OMG. Tiberious actually did that two handed fist thing they always do in Star Trek !!! I was kind of disappointed that they used Fortress Maximus instaed of Metroplex, especially considering that they included Windblade among the Autobots. Last edited by Woodclaw on Thu Feb 14, 2019 10:05 am, edited 1 time in total. I think you mean Windblade. Because I'm pretty sure they didn't include me ! FrishDVH wrote: Mr. Mighty = Cyborg Superman, Captain Thunder = The Eradicator, CM2 = Superboy, and Black Vulcan = Steel. However, given the beings imprisoned therein, the Rock of Eternity cannot be without a guardian, and so Mary volunteered to take Shazam's place. Once again powered by the same gods as before, and further empowered by the mantle of the Rock of Eternity, she became the Sorceress and is working to reinstate Freddy as Captain Marvel Jr. Some months later, allowing for enough time for the four Mighty Mortals to establish themselves, Billy came out of his coma. Still badly injured, he attempted to call the lightning. Given the injury his mortal form had sustained he was unable to absorb the lightning… Mary reacted, drawing in the magical energy where he brother could not. Last edited by Bladewind on Sun Mar 24, 2019 5:40 pm, edited 3 times in total. Last edited by Bladewind on Sat Mar 16, 2019 2:48 pm, edited 4 times in total. Amnesia/ Compulsion – The gods have stricken Eternity of his true name and personal memories, leaving only the power of Eternity in his place. Although his sense of right and wrong is still intact, and he acts in his appointed role to keep the power and the magic of the Earth ream in balance, he does not know who he really is. Champion in Exile - Eternity is (or was) the Guardian of the Rock of Eternity. While his gods still grant their boons and blessings in the form of his powers, they have removed the additional powers and abilities that he had from the Rock. He is "atoning" for his mistake that led to the death of Captain Marvel. Inspired by the art from FrischDVH on DeviantArt. I don't know his headcanon for Reign of the Mightiest Mortals, but this is my take. Captain Thunder was the name Frisch chose as an Easter Egg to a lesser known and former name of Captain Marvel (and a name I wish DC had gone with, regardless of how much I like Green Ronin's Captain Thunder). I chose the name Eternity before I came up with my concept of the backstory as I felt it was a nice tie-in/ nod to the Eradicator in Reign of the Supermen. Obviously, in the RotMM, Eternity takes the Eradicator's place. There area few powers listed, simply for book-keeping purposes, under Champion of Eternity as alternate powers of a base power listed above. This is, as I just said, for book-keeping. Despite going with unlimited PP on this one, I thought it was excessive to go the route of having the Champion of Eternity be complete stand alone powers... Likewise, I did not make a separate entry under his speed powers to include Seize Initiative, leaving that in the total cost of the Advantages granted by his Wisdom. In the final moments of Captain Marvel's - Billy's - epic confrontation with his doom in Fawcett City, Shazam felt something that he had not felt for millennia... fear. Fear that his chosen one - the boy that he had turned into a hero - would die. And with him would soon follow the others who championed in his name, Mary and Freddy. So Shazam used his powers to call Mary and Freddy back to Rock of Eternity and stripped them of his blessing, of their powers. "It's Captain. Not Junior, Not Kid. CAP-TEN. Mental Conditioning - Although he won't lose his powers if he is struck by lightning, Kid Marvel is mentally conditioned against saying the word Marvel. As such, he will never say his name, even when correcting someone who calls him "Kid" or "Junior." He's simply say "Captain." What other mental conditioning has been implanted remains to be seen. Secret - His connection to Sivana sometimes makes him doubt himself, and he worries what fail safe mechanisms the mad scientist might have instilled in him. Young/ Programmed Memories - Kid Marvel has very few real personal experiences, having been grown in a lab with implanted memories. Some of his vocabulary, expressions and the like are dated or sometimes sound force. Also, he also has difficulty in many social situations, although he tries to hide it. Kid Marvel is not specifically intended for the Merge campaign universe, I still used those house rules for the most part. PL 12/180, shifted to PL 11/195 Skills 3:1, free social Advantage per rank of Presence. I chose Kid Marvel as it fit more with my vision of the character and is a little closer to the Superman/ Superboy labeling going on in Reign of the Superman. Kid Marvel - as the papers quickly named him - insists on being call Captain and not Junior or Kid. Sivana created a fictional identity for his new hero, that of Harold Batson to demoralize and confuse the remaining Marvels (Freddy and Mary) as well as to establish a link to the departed Captain Marvel. The "real" identity that Sivana created for his clone was a further jab at his deceased rival, in that he gave Kid Marvel his own surname when creating official documents to establish him as a "real" person, so the latest Captain Marvel is actually a Sivana! Last edited by Bladewind on Sat Mar 16, 2019 2:17 am, edited 1 time in total. Responsibility: Black Vulcan feels personally responsible for the death of CC and Marilyn Batson as he was not on the site when the accident that killed them occurred. As a result, he is determined to make sure their legacy - and that of their heroic children - is carried on. Not specifically intended for the Merge campaign universe, I still used those house rules for the most part. PL 12/180, shifted to PL 11/195 (but apparently I don't know how to count as I wound up with 212...) Skills 3:1, free social Advantage per rank of Presence. Black Vulcan, I imagine, was the name Frisch chose based on his tendency to rewrite/ rework names to suit his vision of a character (or characters). Obviously, in the RotMM, Black Vulcan takes Steel's place.. The radiation immunities are intentional, and will come up more as I stat the other three and weave my version of this story together. Note that his Edltrich Bolt and anything he power stunts off that has Magic and Electricity descriptors. Soon, however, he found himself involved in an incident that the papers were calling the "Reign of the Mightiest Mortals." Rollins had taken the name Black Vulcan, and never claimed to be Captain Marvel. He was fighting in the man's name, carrying on his legacy along Captain Marvel Junior and Mary Marvel and made no claim to their lineage. But with the arrival of himself, the strange being calling himself Eternity, the man claiming to be Captain Marvel's twin brother returned to take his brother's place and the young many insisting on being called Captain Marvel they had all been labeled as being in a fight to claim the legacy as their own. As with the others in my RoftMM line, Mister Mighty is not specifically intended for the Merge campaign universe, but I still used those house rules for the most part. PL 12/180 (unlimited PP in this case asMighty is the Big Bad replacing Cyborg Superman, free social Advantage per rank of Presence. Inspired, of course, by the Cyborg Superman, I actually drew build inspiration from the DCA Captain Atom (Dilustel use will be explained in the background). Although I more or less completed the build (a few things left to add/ tweak...) I don't have time to finish my notes. Depending on how the morning goes, I will try to add... I’ve at least managed to add Complications and a Background draft. Langley was initially also hired by Sivana as part of his expedition to Abu Simbel. Langley was infatuated with Marilyn Batson and made advances that neither Bateson took kindly to. As their participation on the dig was more important to Sivana than Langley’s, Sivana fired the scientist (not really caring about the incident). He built a cybernetic body, using a newly discovered metal from a downed alien spacecraft (a substance that would eventually be used in Project Captain Atom) and combing it with much of the tech used in the creation of Mister Atom he crafted his own ideal replacement for Captain Marvel He then transferred his mind into this latest version of Mr. Atom - who he renamed Mister Mighty. Langley set out to take Captain Marvel’s place and, he hoped, win the woman he believed to be Marilyn Batson... (To this end, the cyborg body of Mister Mighty was constructed not to resemble CC Batson but his general type of man...). Interesting idea doing a "Death of Superman" story with the Marvel Family. Making the hooded "Eradicator" an amnesiac Shazam is an interesting idea, as is the notion of Mary and Freddy being de-powered to create a real impact on the world. Re-using Black Vulcan in this way is actually a pretty cool use of the old name and an update, and could potentially be tied to the Son of Vulcan character that DC has used a couple of times, with different weapon systems designed to replicate the weapons or abilities Vulcan could borrow from the Olympians. Mister Mighty and Kid Marvel are interesting choices, with Mighty being not so obviously cyber-ized and the Kid being a genetic creation to serve a similar purpose. The way the artist used the various symbols is kind of interesting. Mr. Mighty's symbol is the lightning bolt used by the Adventures of Captain Marvel film serial, the first superhero film of all time. The symbol on the Champion of Eternity is based on the Captain Thunder that served as a Captain Marvel expy for Superman to fight in Superman 276. 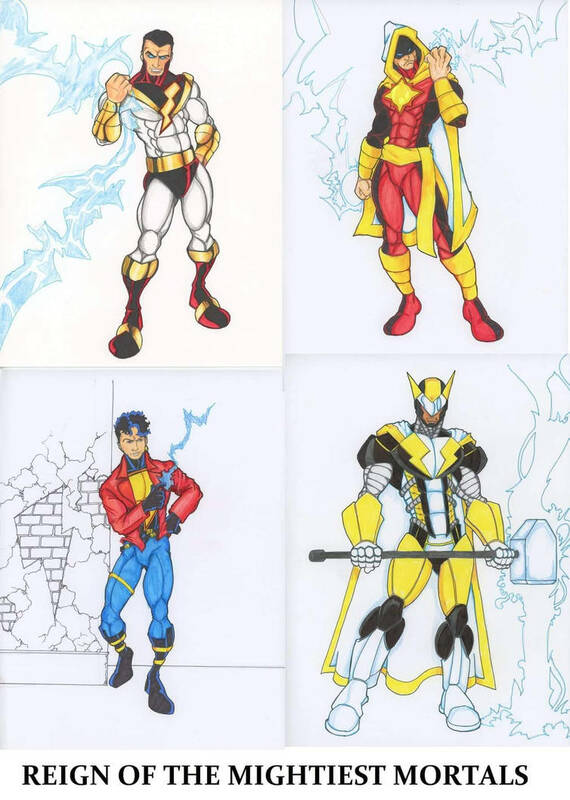 The Kid's is more of the traditional Shazam bolt while Vulcan's looks like a hybrid of the Super Friends outfit and some versions of Black Lightning. I kind of find myself wondering how I'd do a story like this, one meant to deliberately homage/poke fun at the Death of Superman, just in a setting where Cap was the main hero instead of Superman. I as on vacay for a week, and there was one element that I felt was still missing... I had noticed the artist hadn’t done a “Black Suit” version - the return of the Real Superman. Obviously, in the Captain Marvel mythology, the Black Suit is Black Adam. Some interesting analogies can be made there... with Shazam amnesiac, maybe Billy has to turn to Black Adam... but If I can find an alternate version of the Captain Marvel suit I like, I will post the ide that came to me.